French Country Roosters are here. 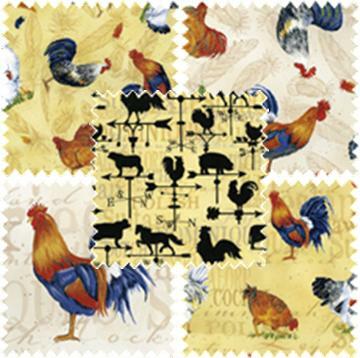 These new French Country Rooster fabrics by Clothworks would be great for placemats, table runners or even curtains for that country kitchen look. The big roosters would be good for applique’s on Tea Towels as well. This entry was posted on Wednesday, September 16th, 2009 at 3:02 pm and is filed under Uncategorized. You can follow any responses to this entry through the RSS 2.0 feed. You can leave a response, or trackback from your own site.